It’s been with you most (or all) of your life. You may not have realized it but closed captioning began all the way back in 1972. It became mandatory along with the Americans with Disabilities Act in 1990. Originally intended to help those with hearing problems, a generation of TV viewers grew to enjoy the captions as a way to watch TV while someone else in the room was making noise, vacuuming, on the phone, or what have you. The first challenges with closed captioning came in the mid-2000s. Because the HDMI cable standard did not create an automatic path for passing closed captioning information to the TV, it was up to manufacturers to build in their own closed captioning decoders and put them into set-top boxes. This was a minor bump in the road but it often meant that since the cable box was doing the captioning, the friendly option to enable captions when pressing MUTE on the TV remote went away. While the faithful complained, the rest of the world moves on and a lot of people don’t even remember that you could do this at one time. Streaming video brought new systems for captioning and new requirements. Most commercially produced videos that look and act like regular TV shows are captioned, and rules have been in place since 2012 that say that anything that even smells remotely like a TV show has to be captioned. Plain-old YouTube videos don’t require captioning, but the web site does have easy-to-use tools for adding captions if you want them. You may have also noticed that many autoplay videos are captioned, since they play without sound. The smart video producer will build in captions so the meanings are not lost. However, all of this blurs the lines between “open captions,” “closed captions,” and “subtitles.” Open captioning is technically captioning that’s on all the time. The original meaning of “closed captioning” implied you had to buy special hardware to see the captions, but the ADA changed that. Technically most of what you call “closed captions” today are actually subtitles. You, the average TV viewer, probably wouldn’t be able to tell the difference, but there are subtle legal distinctions. If the letters are not on a black background and don’t take up a certain percentage of the screen, they’re technically subtitles. In most cases, what you’re looking at is subtitles, and many devices there are both options. Regular folks may not know why this is, but the thing is that closed-captioning rules are a relic of the days when TVs were 19″ and smaller and they don’t translate well to today’s larger TVs. Here’s a whole article on the differences. 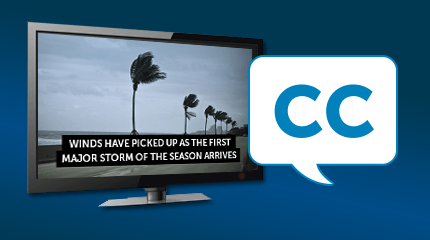 As the world moves to streaming and to programming that’s never actually “broadcast” through traditional channels, closed captioning as it was designed in the 1970s is actually becoming obsolete, but in its place is a robust system of subtitles that is even better. Regulation has kept up with subtitling technology and so, you can be assured that you’ll still be able to see the words on the screen if you want, whether you have hearing loss or just want to figure out what that character on The Walking Dead actually said.